Espinosa Habano was the first cigar to be made in La Zona, Erik Espinosa’s new factory in Esteli, Nicaragua. EO Brands, formerly owned and operated by Espinosa in concert with Eddie Ortega, broke up a few years ago. Both are producing blends on their own now: Espinosa is still producing 601, Murcielago, and Mi Barrio, and Ortega still has Cubao, my favorite of the old EO brands. But as we know, nothing remains static in the cigar world, so both cigar makers have new blends that are quickly gaining in stature. The early EO Brands were made by the Garcia family. That is not an easy act to follow, but Espinosa is keeping the key construction features of those cigars, including entubado rolling and triple-seam caps. Details of the composition of the Espinosa Habano are a bit cloudy. According to Cigar Aficionado and its affiliate publication Cigar Insider, the blend employs Nicaraguan binder and filler leaves with a “mid-to-low priming Ecuador Habano” wrapper. According to Halfwheel.com, the cigar is a Nicaguan puro with a Nicaraguan Habano wrapper. According to the source, it’s nunya business. Espinosa ain’t talking. It seems I have no choice but to implement my own enhanced interrogation and lay some fire on the feet of these resistant subjects. The golden brown wrapper on the Espinosa Habano Toro is attractively smooth but a little bit fragile. The widely spaced views are a good indication that the wrapper is Ecuadorian, but whatever it is, it’s fine looking stick. The roll is solid, but a little bit bumpy, perhaps due to the delicate nature of the capa leaf. The head is neatly finished with a triple cap. One of the toros I smoked had a perfect draw; the other was not plugged, but it was almost too tight to smoke. In both cases the wrapper was reluctant to burn in sync with the rest of the cigar, and then it cracked. My experience is that a blender will often discount a wrapper’s flaws when the aromatic qualities outweigh them, and that seems to be what is going on here. Overall construction: Fair, based on two samples. The Toro opens with lots of black pepper and earth on the palate. The smoke is a little dry, but the flavors are sharp. On the nose there is an oaky vanilla with a touch of cocoa. 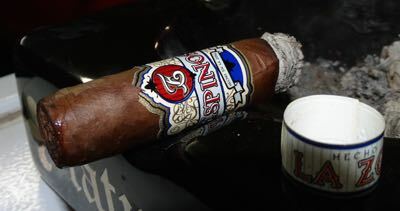 The smoke texture is almost creamy at times; the combination of pepper and cream reminds me a little of another of Espinosa’s cigars: the 601 Connecticut. The flavors don’t transition too much until the last stage of the cigar, but they are complex throughout. The pepper and earth continue strong on the palate but the aroma gets a little sweeter, adding cedar and a fruity element that I can’t quite identify. The aftertaste remains earthy and the finish is long. 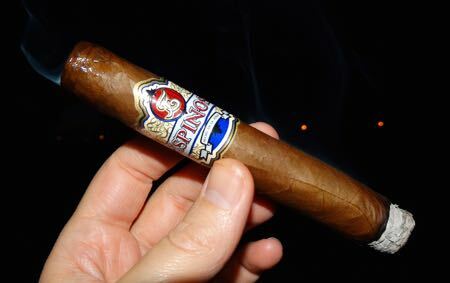 The cigar is about medium in strength, but it flexes its muscles a bit in the last couple of inches. The last stage is packed with pepper and earth until it begins to char at the finish line. The wrapper leaf on the Espinosa Habano is finicky, but oh so tasty. The combination of pepper and cream is unusual, but this toro pulls it off…like peanut butter and sriracha. I have some concerns about the cigar’s construction that require further research, but the flavors are exceptional. At around $6 USD it’s a bit above my everyday smoke range, but the complexity of flavor is commensurate with the price. 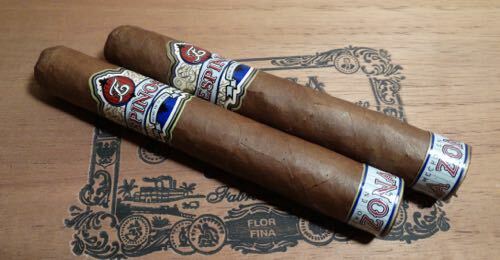 Casas Fumando reviews the Espinosa Habano Robusto. Stogies on the Rocks takes stock of the Belicoso. Stogie Press fires up the Toro. Sriracha and peanut butter? Hmm… At least those aren’t the actual flavors in the cigar. I’ve had several of these in different sizes, and haven’t had any construction problems that I can recall, although it has been a while since I had one. It’s a great mid-priced smoke. That’s good to hear — I’m hoping that I just drew a bad stick; the other one was almost perfect, except for the wrapper cracking. I’ve read a couple other reviews that complained about this, which I expect is due to the delicate wrapper, and smoking in cold dry windy weather probably didn’t help any. Banana? Would that be an Asian Elvis? I will try that sometime, with bacon.